Lets talk ground lean meat burgers today. They can be very tasty, key word can. They take some love and coaxing to get to the point of being extremely delicious, but it is very possible. Fat, fresh herbs, and onions are my go to flavor enhancers. While we try to limit our red meat intake, these lean meats are a nice alternative to the must have burger season. I don’t know about you, but I like burgers. A little fat goes a long way and is healthier way to have it versus an entire burger of red meat. Which I will clarify, I do enjoy. My friend Damian from Beelocal told me about a local company making fats from scratch. Pure grass fed cow fat, duck fat, and soon leaf lard. This is a healthy way to use pure fat that is premium. I enjoy promoting products that I believe in, this is one of them. I fall under the eat real fooders, and chef! By sweating onions and then turning the heat up on them a bit to add color and flavor it helps add depth to the burger. I made these in my cast iron pan, as I needed to be in the house, I was waiting for a package that needed a signature. So you can you either use a pan or go outside and grill. Either way you will be getting a pan dirty for cooking the onions, so utilize that fat and cook the burgers in that same pan. I’ll leave that up to you. 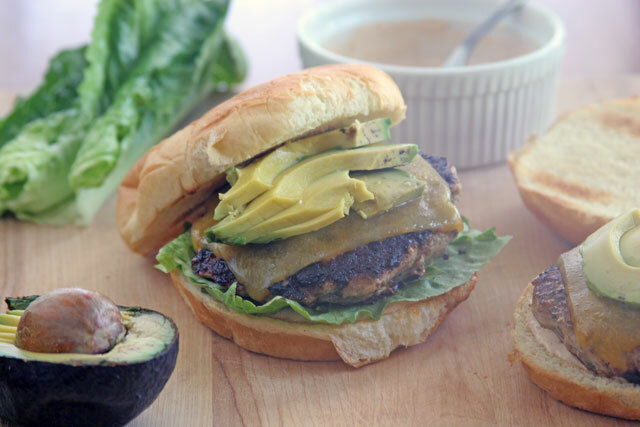 homemade burger buns to kick up your grilling game! 1. 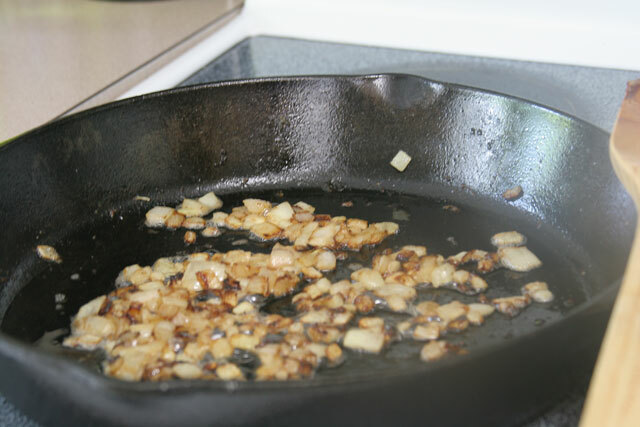 In a heavy skillet or cast iron skillet over medium low heat, add 1 tablespoon of fat and the onions. Sweat the onions for 5 minutes, turn the heat to medium and cook the onions adding some color for 5 minutes. Remove and place in a bowl, put the bowl in the fridge to cool onions down for 5-10 minutes. Once onions have cooled, add the ground meat, and herbs, add chopped bacon here if using. Mix well to distribute ingredients evenly. 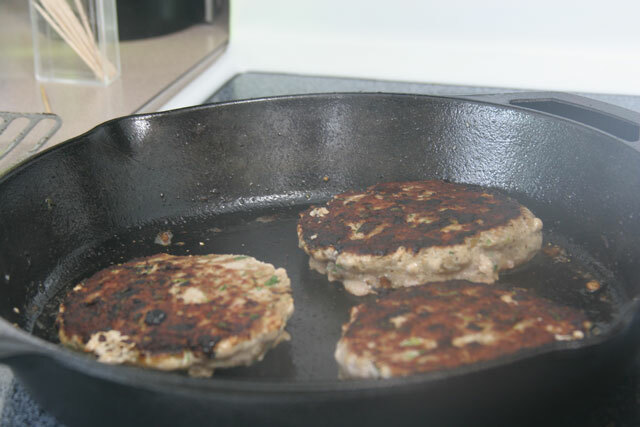 Divide meat into 4 even patties about 1/2 inch thick, 4-5 inch diameter. 2. 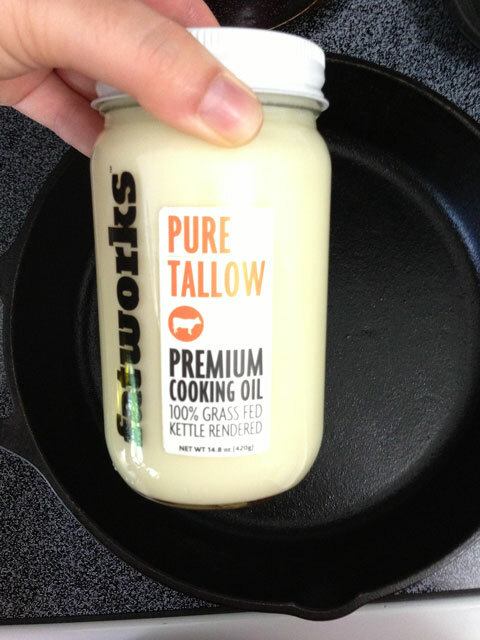 If cooking in the pan, heat 1 tablespoon of the fat in the skillet over medium/high heat. The key is to get a crust on the burger and seal in the juices. So get the pan very hot, but not smoking. Add the patties and sear on the high heat for 2 minutes, then lower the heat to medium, cook for 5 minutes. Notice the sear/crust on the photo below, that is what you want. Flip and cook for 5 minutes. Add the cheese for the last 3 minutes of cooking. If grilling the burgers, mix the ingredients, form patties, heat grill to achieve same sear/crust on the burger, and cook for the same amount of time. 3. Toast buns, smear about 1-2 teaspoons of chipotle lime mayo on both sides of buns, add avocado, lettuce, and tomatoes. Disclosure: I was given the Fatworks product as a gift to test. I took it upon myself to write this recipe and share the fat information with my readers. I was not paid or asked to write any post by Beelocal or Fatworks. This is just an awesome community of people who share a love for food and good products. LOVELY! I’ve been sitting on a turkey burg post for a while, I am so happy you posted this. I gotta get to it. Also O EM GEE on the Fatworks front! I can’t wait to try their stuff! Do they have a storefront?